Therapists who have earned the credential of Registered Play Therapist through the Association for Play Therapy know the importance of including parents as an essential part of the treatment plan when we see children for play therapy. Many play therapists also provide sibling sessions and whole family sessions blending play therapy with family therapy. There are tremendous benefits to bringing play therapy and family therapy together. I believe deeply in the power of play as an agent of change and healing within a family system for all members of the family. When a child is struggling, it is often important for the entire family to be seen, heard, understood, and supported in order for the child to heal and grow within that family system. Play Therapy with Family Therapy Ideally Go Hand-in-Hand! Amy Reamer, LMFT, RPT owns a group practice in Virginia where she utilizes play therapy to help children and families. When I spoke to Amy recently she said, “Family play therapy works well because it externalizes the issues so the finger-pointing and blaming behaviors go away and defensiveness disappears which can lead to healthier and more authentic healing communication. When families have been struggling, living in discord and negativity the play based interventions bring back the joy and harmony in their relationships. That in itself is often their goal for therapy! Play is the child’s language and as play therapists we are trained in understanding and speaking their language; but play is not only for children. Play is for all ages Play helps strengthen connections between people. When parents are encouraged to play with their children, we know that the parent-child bond is enhanced. When parents learn how important it is for children to play for healthy brain and body development, they are more open to the idea of engaging in playful activity with their children. Stacy Jagger, LMFT, RPT provides play therapy within family systems in her private practice outside of Nashville, Tennessee. 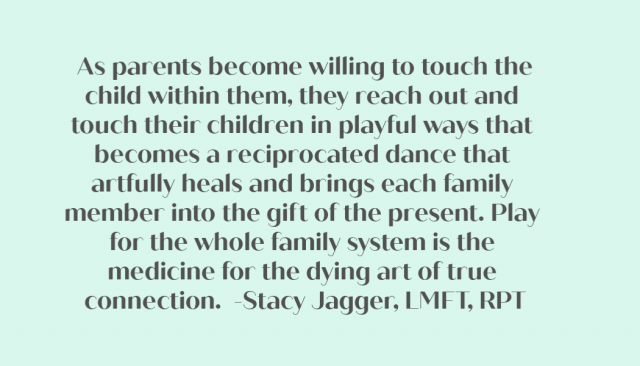 Stacy has shared with me that she is able to help families restore real connection through the power of play and she is able to efficiently help children and their parents heal and grow by helping the parents find and reach their own inner child using playful interventions. I recently led a live webinar called Fun & Effective Play Therapy Interventions for Family Sessions. It is now available as a recorded training free when therapists sign up to receive my weekly play therapy resources newsletter. 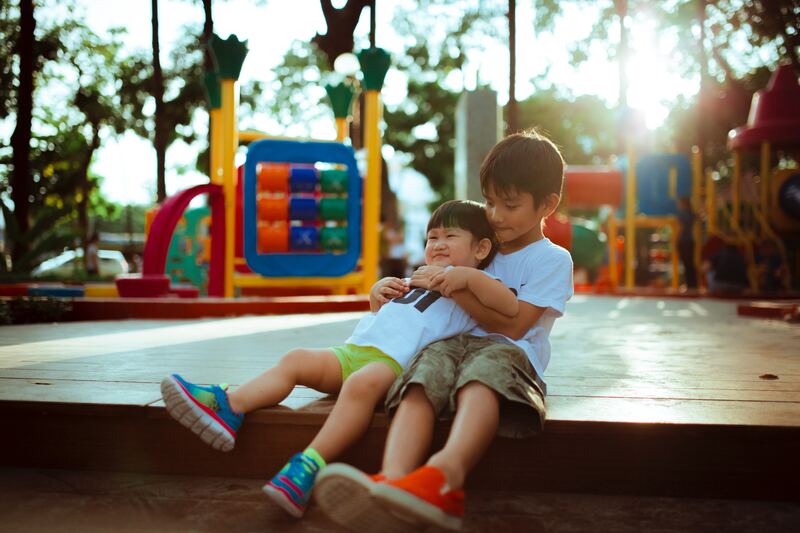 That 90 minute training introduces 11 play therapy interventions that can be used in family therapy sessions to facilitate exploration, expression and connection. If you’d like some overview training of many of the modalities you can use to bring parents into the therapy process, check out this 2 hour training called Including Parents in the Playroom that provides NBCC and APT training hours. If you are a therapist utilizing play therapy, I encourage you to include and involve the entire family, and allow play-based methods to serve as a powerful agent of positive change and growth for not only the child you are treating but for the entire family. Families really appreciate being involved in the healing process, and it takes away any blame towards the child. Great read!